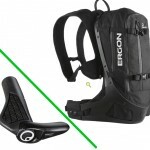 Sporty bag and the best ergonomic carbon grips donated by Ergon with a combined value of $350! This entry was posted in Raffle 2011. Bookmark the permalink.